Enter Machu Picchu through the Sun Gate, trek for three days across the beautiful Lares region and explore the impressive sights of the Sacred Valley of the Incas. A superb alternative to the classic Inca Trail, this fantastic two week holiday reaches its climax at Machu Picchu the most celebrated of all the Inca ruins, where we arrive through the iconic Sun Gate having trekked the final day of the Royal Inca Trail. 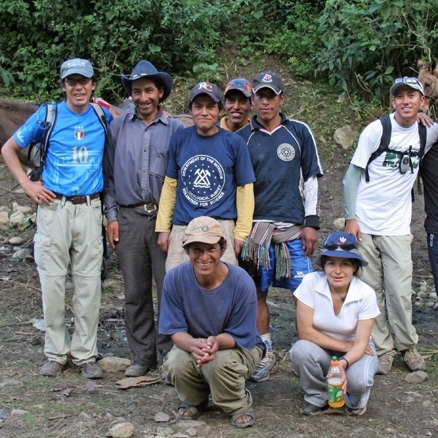 Before this, our journey takes us away from the crowds on a three day trek in the beautiful Lares region. Here, we follow trails through verdant valleys and over high passes, meeting the local Quechua people who have retained a way of life little-changed through the centuries. Terraced fields are still hand tilled and traditional clothes handwoven from soft alpaca fur dyed into a rainbow of colours. The scenery in the Lares area is outstanding and, as we climb to over 4,400m, we enjoy breathtaking views across to the peaks of the snow-clad Urubamba mountains. To acclimatise for our trek we enjoy time in the attractive city of Cuzco and explore key Inca sights in the Sacred Valley. But it is the magical views of Machu Picchu, laid out before us in its full glory as we emerge through the Sun Gate, that live longest in the memory. Fly London to Cuzco, transfer to your hotel, afternoon at leisure. Walking tour of Cuzco and visits to Inca ruins at Sacsayhuaman and Tambo Machay. Drive to the Sacred Valley. Visit Pisac ruins and market. Acclimatisation walk from Moray to Salinas. Drive to Totora, begin Lares trek. Trek to Quishuarani, cross Huacahuasi pass to village, continue to Patacancha valley and end at Patacancha Village. Free morning in Cuzco. Transfer to airport for overnight flight home. You will be accompanied throughout your holiday by a local English-speaking guide. These leaders are very knowledgeable and extremely charming and friendly and in their company you will enjoy an insider’s view of Peru. Day 1 - Fly London to Cuzco. Depart London on your overnight flight to Cuzco. Day 2 - Arrive Cuzco. Group transfer to hotel. Afternoon at leisure. On arrival in Cuzco you will be met and transferred to your hotel. You are at 3,353m/11,483ft here so for the rest of the day you will need to take it easy to help your body acclimatise to the thin air at this altitude. It is a good idea to rest or maybe explore locally and enjoy your first impressions of this vibrant city. Day 3 - Morning walking tour of Cuzco. Afternoon at leisure. Today you have the opportunity to stretch your legs and acclimatise to the high altitude with a delightful short walking tour led by a local guide. Whether your interest is exploring Inca ruins, visiting colonial churches, bargain-hunting in Indian markets, or just relaxing on a cafe terrace overlooking the Plaza de Armas, Cuzco has it all. Formerly the capital of the extensive Inca Empire, today the foundations and walls of Inca buildings are overlaid by Spanish architecture. Fine Inca stonework has survived centuries of both earthquakes and Spanish colonialism. When the tour is finished you will enjoy lunch at the Museo del Café after which the rest of the day is yours to do a little further exploration, browse the city's many tempting shops, or simply relax at your hotel. Later in the afternoon you will be given a full briefing for the adventure ahead. Day 4 - Visit Cuzco's outlying ruins at Sacsayhuaman and Tambo Machay. You venture a little further afield today to visit two of the most celebrated Inca sites that are scattered around the Cuzco hills. Sacsayhuaman is the closest and most impressive of the sites with its magnificent Inca walls built from huge rocks fitted together with such precision that not even a piece of paper will fit between them. The site was originally thought to be a fortress but more recent theories suggest a great temple to the Sun with evidence of an altar and seats cut into the rock. Not far from Sacsayhuaman lie the ruins of Tambo Machay. These ceremonial Inca springs or baths are still in excellent condition and comprise several water fountains on three different levels and a rock pool which is ingeniously filled via a hidden channel. Having explored the site you will return to your hotel for the evening. Day 5 - Transfer to the Sacred Valley. Explore Pisac town and market. After breakfast you say au revoir to Cuzco and drive into the Sacred Valley of the Incas. The Sacred Valley, or Vilcamayo to the Incas, is a beautiful, fertile valley carved by the Urubamba River which flows from the high Andes all the way to the Amazon jungle. Marking the opposite ends of the Sacred Valley are the two remarkable Inca citadels of Pisac and Ollantaytambo. Pisac lies at the eastern end of the valley and here, situated above the town, is an extensive Inca complex clinging to the mountain top. The citadel at Pisac was originally positioned on a major Inca route into the Sacred Valley and controlled access to the eastern jungle. The ruins are set high above the valley floor and there are tremendous views from there. Terraces, water ducts and steps are cut out of solid rock, and in the upper sector of the ruins, the main Intihuatana is equal to anything at Machu Picchu. Above the temple lie still more ruins, mostly unexcavated, and among the higher crevices and rocky overhangs several ancient burial sites are hidden. You will have time to explore on foot for an hour or two with time to take in the best of the ruins and to enjoy the superb scenery and commanding views. You will also have time to visit Pisac's famous market with its many artisan stalls before continuing to your hotel. Day 6 - Walk from Moray to the salt pans at Salinas and on to your hotel. Your acclimatisation walk today combines big views and ancient towns, local farming techniques and pre-Inca salt pans with an easy descent to the valley below. Firstly, you drive out of the valley and across the grassy plain to the extraordinary Inca earthworks of Moray. There is no other Inca site quite like Moray - three crater like depressions are lined with a series of concentric circular terraces disappearing down into the earth. Some think that this may have been the site of sophisticated Inca agricultural experiments with each terrace representing an altitude zone. It is thought that the terraces' containing walls were filled with fertile earth and watered by complex irrigation systems which enabled the Incas to grow more than 250 plant species. From Moray you then follow an old mule trail the short distance to the ancient town of Maras with its vast church and outstanding colonial Spanish door arches. Maras was formerly famous for its spies, due to its strategic location above the Sacred Valley enabling the local inhabitants to keep track of the movement of all travellers in and out of the valley. From Maras you will then walk back down into the Sacred Valley, a descent of a couple of hours. En route you will walk through the shimmering terraced salt-pans of Salinas where salt has been harvested since pre-Inca times. The salt pans cover the whole hillside and in sunny weather you will be dazzled by the white of the pools. Day 7 - Transfer to Totora for the start of the Lares trek. Trek and then transfer to Quishuarari. A scenic two hour drive through the Sacred Valley of the Incas takes you to the start of your trek at the small village of Totora. From here you start walking following an ancient Inca Trail into a narrow canyon where you will find Inca tombs perched high up in the cliffs. Emerging from the canyon you pass through tiny rural communities where it seems time has stood still before reaching a lovely spot where you will have a picnic lunch. After lunch you are transferred by vehicle to the small and very traditional community of Quishuarari, 3,700m/12,139ft, where you will be camping overnight. Day 8 - Trek to Cuncani via the Huchayccasa Pass, 4,300m/14,108ft. Bus to camp at Chancachaca, 3,440m/11,286ft. This is a stunning day's trekking. You leave camp behind and climb past colourfully dressed locals, and up towards the native forests that Amazonas Explorer has been heavily involved in re-planting. These forests harbour Andean deer, vizcachas and several rare species of birds and are essential to the future of this area. A further push and you reach the stunning views from your highest pass of the trek, the Huchayccasa Pass, 4,450 m/14,600 ft. A chain of emerald blue lakes fills the hillside below you, and in the distance rise the snow clad Urubamba mountains. Descending through hand turned potato fields you come to the upper reaches of the ancient community of Cuncani at, 3,800m/12,4600 ft. From here our bus takes you twenty minutes to your camp at Chancachaca, 3,440m/11,286ft. There is an option to visit the Lares hot springs after lunch. Day 9 - Trek to the Patacancha Valley via the Ipsaycocha Pass, 4,400m/14,436ft. End trek and transfer to hotel. This is a day filled with encounters with locals. Men head off to work in the potato fields, wooden ploughs slung over their shoulder. Women sit, legs outstretched weaving their traditional clothes on wooden looms. And small children sit motionless guarding herds of alpaca and llama, their ever faithful dog by their side. You start your trek this morning fifteen minute's drive from camp to begin towards the final pass. Lying at 4,200m/13,780ft the Ipsaycocha Pass marks the border between Lares and the Patacancha Valley. You start gently and then climb one final steep section to gain the summit. If you are lucky, you will have spectacular views of Mount Veronica. You take lunch by the beautiful Ipsay Lake then follow an ancient trail to the Patacancha Valley and the village of Patacancha where the trek ends. A vehicle takes down the valley and to your hotel for the night. Day 10 - Transfer by train to Km104 and trek the Royal Inca Trail to Machu Picchu. From the station at Ollantaytambo you catch a train to km104, the starting point for those taking the short Inca trail to Machu Picchu. Your trek starts by visiting the recently restored ruins of Chachabamba before gradually ascending through tropical cloud forest up towards the base of the spectacularly situated Inca ruins called Wiñay Wayna (Forever Young). Here you climb more steeply on old Inca stairways through beautiful terraces, stopping to explore the various buildings and water features. After a picnic lunch you continue on perhaps the loveliest part of the whole Inca Trail. Lush vegetation flanks you on either side, the scent of wild orchids fills the air, and brightly coloured tropical birds fill your ears with song. Soon you will reach a final set of stairs to arrive at Inti Punku, the gateway of the Sun. As you step through the old stone gate-way, Machu Picchu appears laid out before your eyes. A truly magical sight. After plenty of photos you carry on along the trail and then through the incredible ruins to catch the bus down to the lively town of Aguas Calientes, also known as Machu Picchu Pueblo. Day 11 - Return to Machu Picchu for a guided tour. Afternoon train to Poroy. Drive to Cuzco. After an early breakfast, you drive the short distance back up the zigzag road to Machu Picchu to get there before the main crowds and also when the light is better for those all-important photos. Machu Picchu is a place that really lives up to expectations; the setting is breath-taking and the ruins themselves are sensational. For years it was lost to the jungle. Rediscovered in 1911 by the Yale professor Hiram Bingham, declared a UNESCO World Heritage Site in 1983 and one of the New Seven Wonders of the World in 2007, Machu Picchu exceeds all expectations. You will enjoy a guided tour lasting around two hours covering all the main points of interest such as the Temple of the Sun, the Royal Tomb, the Sacred Plaza and Intihuatana - 'the hitching post of the sun'. Before the tour you have a few hours free to wander amongst the old Inca walls and just sit and take in the scale of the place on your own. Eventually the time comes to catch the bus down to Aguas Calientes and board your train back along the Urubamba River. The scenery is beautiful and the train jolts softly along, allowing you to sit, stare out the window and reflect on a wonderful adventure. You alight at Poroy station where your transport back to Cuzco is waiting. Day 12 - Morning free in Cuzco. Group transfer to airport for return flight to UK. This morning is free to enjoy a final wander through the streets of Cuzco and perhaps buy some souvenirs to take home. In the afternoon you will be transferred to the airport for your return flight to the UK. Day 13 - Arrive UK. Today you will arrive back home in the UK. Everything went like clockwork from first to last. Our local guides looked after us amazingly well and were mines of information about everywhere we visited. We saw fantastic sights - from remote mountain villages on the Lares Trek, to tourist hot-spots around the Sacred Valley and Machu Picchu, to city sophistication in the Miraflores district of Lima. We met interesting people, encountered amazing wildlife, ate (too much!) wonderful food and all in all had the most memorable experience on a continent we had never visited before. It was great to visit mountain communities and to trek traditional ancient paths once used by the Incas and still in constant use by the local farmers today. The high passes that you cross feel wild and remote, but one of the great pleasures of the trek was meeting locals along the way, herding their llamas and tending to their high pastures. The Sacred Valley, with its amazing Inca remains, can at times feel quite busy, but out on the Lares trek you really do get away from it all. A visit to Lake Titicaca will prove a very worthwhile addition to any trip to Peru. Enjoy a spectacular rail journey from Cuzco with stunning views, climbing to a height of 4,319m /14,170ft before descending to Puno. Get an insight into a unique soceity and culture that has adapted to this harsh but beautiful environment. Lake Titicaca is the largest lake in South America and set on the high altiplano of Peru at 4,103m/12,507ft it is generally considered to be the highest navigable lake in the world. On this extension you leave Cuzco on a comfortable coach to cross a high pass at La Raya at 4,319m /14,170ft, before descending to Puno, a city on the shores of Lake Titicaca. The lake itself is starkly beautiful and views of both Lake Titicaca and the mountains beyond are truly spectacular. You will spend a whole day on the lake observing the unique way of life of the people of the Uros Islands before a visit to Taquile Island gives you the opportunity to see how a distinctive and independent minded society has adapted to this harsh but stunning environment. There may also be time to visit the fascinating pre-Inca ruins at Sillustani before catching your flight back to Lima. Spend 2, 3 or 4 nights deep in the Amazon rainforest. Stay in a choice of jungle lodges. Enjoy a selection of wildlife viewing activities accompanied by expert guides. Fly from Cuzco with all transfers, meals and activities included. For a complete contrast to your trek or tour in the Andes why not visit the lush Amazon jungle? A short but spectacular flight will take you over the mountains and down to the Amazon basin. The Amazon basin encompasses nearly 3 million square miles, of which two thirds is covered by rainforest and comprising the largest and most bio-diverse tract of tropical rainforest in the world. For your Amazon extension you will fly to the city of Puerto Maldonado and from there travel down river to your jungle lodge. We offer a selection of jungle lodges with various standards of accommodation and wildlife experience. You may also choose whether to stay for 2 or 3 nights in the jungle or even a longer more adventurous expedition of 5 days downstream to the Tambopata Research Centre. Before or after your trip to Ecuador or Peru why not add on an exciting Galapagos island cruise. Cruise boats in the Galapagos are quite small and tend to get booked up well in advance. If you wish to travel to the Galapagos we would check out available boats in various classes for your dates and could then offer you a choice of boat and itinerary. For more details download the pdf sample itinerary, or contact our office to discuss your options.